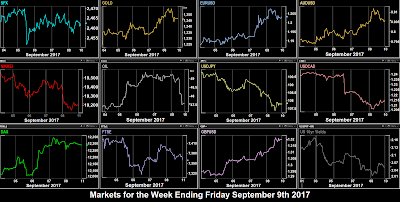 On Monday, North Korea tensions continued to fade, and SPX, DJIA and NDX all edged up to another all-time high, and the risk-on mood was confirmed by JPY and bond prices hitting a seven-week low, and Gold a two-week low. DAX also made a seven-week high, and FTSE and NKY were also up. The picture with USD was similarly positive, and only EUR was (slightly) stronger on the day. After some volatility, Oil settled nearly flat, a mere 10c down on the day. Tuesday was a quiet day, and the general trend continued in equities. SPX was slightly up, NKY and FTSE a little more so. Nevertheless another all-time high for SPX. DAX gave up ground as EUR advanced, despite the German ZEW sentiment beat at 0900. Gold was up slightly and AUD followed. Otherwise USD was flat, as were bond yields. Oil showed some volatility but and ended the day slightly up. The API stock beat came after the open outcry market closed. Wednesday was the big day, the FOMC rate set, which was a hold at 1.25%, but with hawkish remarks about further rate rises and balance sheet tightening. The FOMC didn’t have a big effect on equities which were flat (although SPX and DJIA inched to yet another ATH). The exception was NKY which rallied on the release, but purely its usual reaction to JPY weakening. However VIX fell below 10 for the first time since early August. In forex, the FOMC effect was much more pronounced. USD rallied strongly against all currencies, as did bond yields, and Gold fell. The only exception was AUD which had been rising all day. The FOMC slump pushed it back to flat on the day. GBP had also been rallying, but gave up all its gains, and more to FOMC. This pushed DXY to a three-week high of 92.70. Surprisingly Oil had its best day of the week, rallying 1.02% in spite of the EIA Stock miss (4.59M vs 3.49M). Thursday saw equities wobble. SPX gave up 0.3% but still held above 2500, nevertheless after a rally to 10.2, VIX actually closed down at 9.7. Other indices were similarly down, FTSE giving up the week’s gains on strong sterling. The currency situation was mixed. EUR and GBP recovered most of Wednesday’s losses, but Gold and AUD carried on downwards. Despite the BoJ rate decision (hold), JPY was flat on the day, as were CAD and Oil (after a brief dip in the latter). Friday saw a keynote speech by Theresa May on Brexit, and FTSE soared 56 points (0.78%) on the day. Or was that the reason? Perhaps it was just that GBP gave up 0.64% to erase Thursday’s gains. Trump’s tax plans were delayed, yet DAX and SPX were also up, reversing some but not all of Thursday’s losses. SPX finished the week exactly flat. NKY tracked USDJPY as usual and was down. USD was mixed, it was flat against EUR and CAD after spikes up in both currencies in the European session. However, DXY was slightly down on the day, despite the GBP fade as JPY gave up some of Wednesday’s gains. AUD and Gold were up, but the latter stayed below $1,300. Oil was flat, but held on to mid-week gains following speculation on an extension to output cuts. Yields were slightly down, but still finished up 6bp for the week. These are the prices movements for the week on the instruments we cover. The best forex trade of the week would have been EURJPY up marginally more than USDJPY at 2.44%. The strongest index movement was again NKY at 1.22%, driven largely by a falling yen. As we go into the final week of the month and quarter, the weekend saw elections in New Zealand and Germany. For the fourth time, New Zealand saw a hung parliament with the National Party taking most seats, and given the NZD rate decision is this week, there will be more focus than usual on the Kiwi. Otherwise the US tax plans on Monday, and the GDP and PCE (a proxy for inflation) on Thursday/Friday, will be the main events. On Monday, the Trump administration is scheduled to disclose further details of their tax reforms. This is the most important item today. Also ECB President Draghi will speak in Brussels. Focus continues on New Zealand. We expect volatility in NZD after the election, and the Trade Balance print may be a focus. We will also see the first steps to the formation of a government by coalition, with Winston Peters of anti-immigration party NZ First being the kingmaker. He has already said he will take his time making a decision, although Peters has already expressed antipathy for the Greens. Mathematically the only majorities possible are National+NZ First, or Labour+Greens+NZ First (or National+Greens which seems unlikely). Tuesday sees Fed Chair Yellen speak at 1645, with a Q&A session afterwards. Before that Fed Mester (hawk), Brainard (dove), and new member Atlanta Fed President Bostic are speaking. Like Monday, data is light on the day. Wednesday’s releases are UK GDP at 0830 and of course the weekly Oil Stocks report, but again we turn to New Zealand for the RBNZ rate decision (1.75% hold expected) at 2100. Although no surprises are likely, the post-decision speech comes from the new acting Governor, Grant Spencer, who is considered to be more hawkish than outgoing Governor Wheeler. Thursday has plenty of economic releases. The main figure is US GDP, released at the same time as the QoQ PCE. For some reason, the YoY and MoM PCE figures are not released until the next day. These are probably the most important data releases of the week. Turning to Japan, there are a raft of releases: inflation, unemployment and retail sales. Note there is a special session of the Japanese Diet (Parliament) where PM Abe is rumoured to be calling a snap election for October 22. Friday sees an unusual event, BoE Governor Carney “in conversation” with ECB President Draghi. Closing remarks are delivered at 1445. Earlier in the day we have Eurozone inflation, German unemployment, and the MoM and YoY prints for US PCE. A strong print for the first of these could have a significant effect on EUR. The world was expecting a North Korea missile test over the weekend on their National Day and didn’t get one. Also Hurricane Irma turned out not to be as bad as feared. So markets rose sharply on Monday, and SPX made a record close. Other indices were also sharply up. USD followed the sentiment and had a good day. Gold and JPY were down against the dollar, classic risk-on, as were AUD, EUR, and GBP and 1-year bond yields were up. Only CAD was up, after the Housing Starts beat we mentioned last week, and a rise in Oil. After two good days, Wednesday was more or less flat for equities, although the SPX put on two handles to close at 2498, another record, despite a 0.8% drop in AAPL after traders were underwhelmed with the $999 iPhone X and cellular watch launch at 1700. DXY touched a one-week high as it rose sharply (0.7%) against EUR and 0.4% against JPY. AUD and Gold were similarly down, and yields were again up. The unusual thing was the sharp rise in USD came at a strong but steady pace immediately following the Producer Price Index miss (0.2% vs est 0.3%, prev 0.1%). This is still a rise from last month, and perhaps this figure was seen as front-running Thursday’s inflation figure, a fact we alluded to last week. The exception, again was CAD, which benefited from a steady bid in Oil all day, despite the EIA stock miss (5.88M vs 3.23M) at 1430. This miss was not as bad as the API print the day before had predicted of course. Thursday saw another slow day for equities. Although the SPX did hit another intraday high it closed lower, and in general indices were flat. Like Tuesday, the exception was the FTSE which faded 83 points (1.12%) on GBP strength after the BoE rate decision. The decision was a hold (0.25%) and the votes were as expected, but hawkish comments from Governor Carney saying rate rises “may be as early as in the coming months” added an immediate 97 pips (0.73%) and a total of 186 pips (1.41%) on the day. AUD was surprisingly only slightly up after the stellar jobs print of 54.2k, equivalent to an amazing 731k in US NFP terms. Of course AUD is already up 9% against USD since May, and at two-year highs. There was a relatively muted reaction to the US inflation beat (1.7% vs est 1.6%). at 1230, the first important US release of the week. Maybe this is because the estimate had been downgraded, it was set at 1.7% as we reported last weekend. The net result of all this was downward pressure on USD with the usual exception. Gold was up and USD was down against all currencies except CAD, which dipped briefly but ended the day slightly up, which is where Oil also finished. Friday saw another North Korean missile test, mentioned as a response to sanctions, but who knows what Chairman Kim is thinking. However the “boy who cried wolf” factor seems to have set in, traders now seem to have a “missile fatigue” and SPX finally closed about the psychological 2500 mark, setting yet another all-time high. This was despite the strong US Retail Sales miss at 1230 (-0.2% vs +0.1% estimate), although some commentators put this down to a Hurricane Harvey blip. In natural disasters, overall spending is higher, but not at first. The immediate emergency must pass before reconstruction spending can start. The risk-on indicators for the day (lower Gold, lower JPY) were present, and NKY was also up. However DAX was down, possibly because of a recovering EUR, and FTSE was sharply down again, definitely because of further gains in GBP. Cable repeated Thursday’s gain exactly, putting on another 1.40%, to make 3% on the week, and close at 1.3589, the highest level since the Brexit vote and crash. This was because of comments made by Gertjan Vlieghe, regarded as the most dovish of the UK MPC who echoed Carney’s sentiments, even using the exact phrase we have quoted. Remember that the current rate is 0.25%, lower than the 0.5% which held for all the years following the 2008 crash, so talk of [a programme of] rises, in the plural, is more significant than a mere return to 0.5%. DXY was down on the day because of this, and EUR strength, and AUD was also up. CAD gave up some of its gains, Oil was flat, but 10-year US yields were slightly up. These are the prices movements for the week on the instruments we cover. The best trade of the week would have been GBPJPY up 5.54%, an outstanding forex result for one week. The strongest index movement was again NKY, but buying Oil would have been better at 4.77%. This is central bank week, with reports from the RBA and ECB, and the all-important Fed rate decision, followed by the BoJ decision a few hours later. There is little to report over the weekend. Monday sees BoE Governor Carney speak in Washington DC at 1500, although a lot of the action is already behind him. The main calendar release is Eurozone inflation where the MoM figure is expected to recover to +0.3% from -0.5% last month. Tuesday has RBA Minutes in the Asian session, and a speech by Rep Gov Lane from the increasingly important BoC at 1815. News is otherwise light. Wednesday is Rosh Hashanah, the Jewish New Year, and main event of the week, the Fed rate decision. The CME FedWatch tool has a 98.6% likelihood of a hold (the other 1.4% is for a cut! ), so as usual traders will be following the comments. This month, in a change to usual procedure, there is a FOMC Economic Projections report issued at 1800 along with the rate decision, and the press conference is 30 minutes later. Last week’s CPI was finally upbeat, and commentators are expecting some indication of balance sheet reduction. With USD recently at 33-month lows, expectations are to the upside. Thursday’s Asian session sees the BoJ rate decision, hot on the heels of the Fed. A hold is expected. Note the press conference is four and a half hours after the rate is revealed. It is unlikely that this will overshadow the Fed, whose effects normally run for several days. UK PSBR will give us the chance to see if GBP front-runs the print, as it does for so many releases. Friday has some PMI releases, but the main calendar event is Canadian inflation. The estimate of 1.5% is a big step up from last month’s 1.2%. Remember of course that the Canadian rate hike has already happened, so a miss could halt CAD’s recent strong run. In the US, the Trump administration is scheduled to release some tax reform plans. We also have a range of Fed speakers Williams (centrist) at 1000, George (über-hawk) at 1330 and Kaplan (slight dove) at 1830, however their effect may be muted so soon after a rate decision. 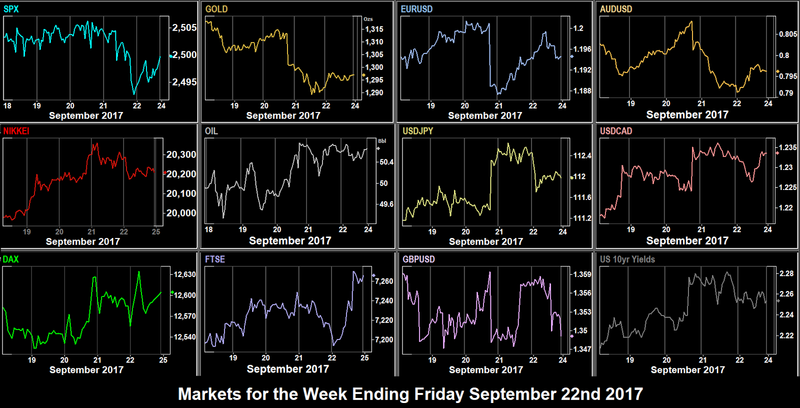 As the new month got underway, Monday saw NK tensions again after the nuclear bomb test, and markets gapped down. However, it was Labor Day, with only futures open in the US. Volatility and losses were therefore moderate, and DAX had closed the gap before the US bell. Other indices also rose after the gap, and all ended moderately down on the day. Other news had little effect. USD reflected the tension and fell against most currencies except AUD, surprisingly as Gold rose to $1,339 at one point, its highest Trump-era price. As the day continued USD recovered slightly, and DXY finished only slightly down. 10-year US bond yields gapped down 6bp, and then only moved 1bp during the day, to close where they opened at 2.167%. 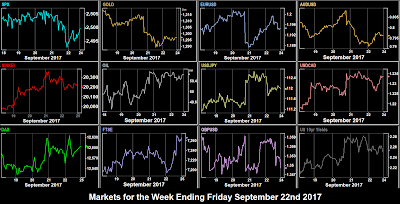 Tuesday saw US markets open again, and the reaction to the NK nuclear test kicked in. After the US Factory Orders miss at 1400 SPX fell 0.8% on the day, and even more in financials and technicals (NDX fell 0.92% including the gap). Only energy stocks held up, buoyed by the sharp 2.55% rise in Oil. Non-US indices were also down sharply. USD followed suit and was down again all currencies, particularly JPY, and gold was up to a new 2017 high. Yields fell sharply. Altogether, a risk-off day. The RBA rate hold at 1.5% (0430) had little effect, although the psychological 0.80 level was briefly breached. We often talk about Turnaround Tuesday, but with Labor Day being a holiday, Tuesday’s pessimism was turned around on Wednesday. News that the US debt ceiling would be extended helped all markets up, despite US PMI misses) DAX was the standout instrument. It put on 1.77% as EUR recorded a flat day for once. The big news of the day was the surprise Canadian rate hike from 0.75% to 1%. The loonie immediately rallied 270 pips (2.17%) to touch a 28-month low. It then recovered a cent and finished 1.2% up on the day. 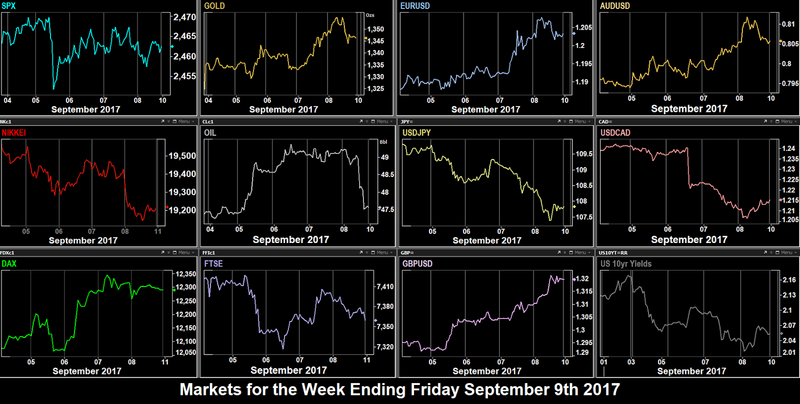 Otherwise, as with EUR, USD had a flat day against AUD and GBP, but took assumed some risk again as gold, JPY, and bond prices were down. Oil extended Tuesday’s gains a little further, putting on 1.15%, the API stock print of 2.97M vs -5.78M previous being after the pit closed. 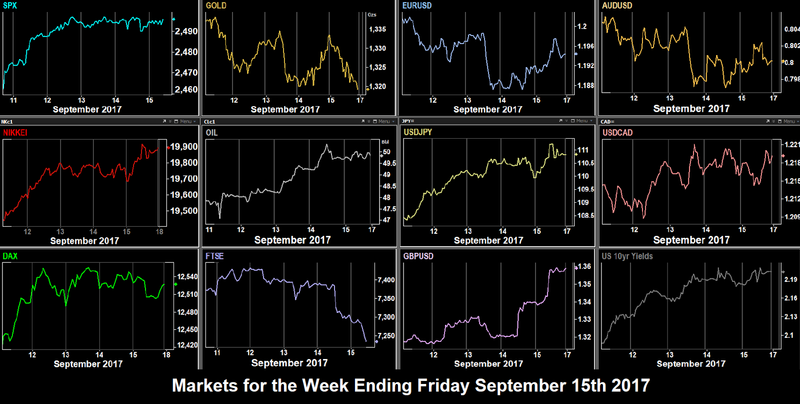 Equities took a rest on Thursday, with the negative potential effects of Hurricane Irma balancing relief about the debt ceiling. After some volatility following the big Initial Jobless Claims miss (298k vs 241k) caused by Hurricane Harvey, most indices ended the day flat, as did Oil, not really reacting to the EIA stock miss at 1430. Only FTSE showed some life rising 30 points (0.40%) despite GBP also appreciating. All eyes were of course on ECB President Draghi’s speech at 1230. Despite alluding to fears about the strength of the Euro on European competitiveness, he did in the end have to say something about tapering – it would be discussed in October. This was all traders needed. As we predicted last week, EUR promptly put on 92 pips (0.77%) to go back above $1.20. Unusually, the spike took 30 minutes to unfold as traders digested the speech. USD had a bad day all round. DXY touched 91.41, a level not seen since January 2015, as it gave up ground against all currencies, not just the Euro. CAD continued its rate hike gains, and non-DXY component AUD roses, Gold hit a new 2017 high up 1.10% to $1348.17. Yields were down again at a 2017 low. 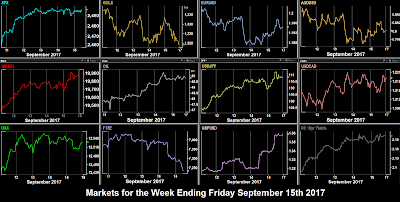 The week was more volatile for currencies than indices and Friday saw a flat close in SPX and DAX, and a fade on X% in FTSE. SPX and FTSE completed a rare inside week. NKY however was down 0.6% on yen strength. USD gave up ground across the board, EUR briefly hit a new high of $1.2087, and DXY hit another 33-month low, on a mix of Hurricane Irma and North Korea National Day risk aversion. Also contributing to dollar decline this week were the resignation of Fed Fischer (centrist), and dovish speeches from (to be fair, known doves) Fed Dudley and Brainard. Gold hit another new high of $1357.57 before some profit taking took it marginally down on the day. Similarly CAD hit a new high on the jobs beat at 1230, but again finished the day slightly down. In a possible delayed reaction to the EIA miss on Thursday, Oil fell sharply by 3.34% giving up virtually all its gains for the week. These are the prices movements for the week on the instruments we cover. Every currency was up against USD, so the best forex trade of the week, for once not a cross, would have been short USDJPY, a gain of 2.41%. The strongest index movement was therefore unsurprisingly NKY, down 2%. Over the weekend we have Chinese inflation and PPI figures and an increase is expected. Saturday was National Day in North Korea, and another missile launch was expected – and priced in. No launch happened so this might be a boost for markets, although a gap up like last week’s gap down might be a stretch. Of more concern is Hurricane Irma which has battered the Caribbean and will make landfall in Florida. We already saw a huge spike in Initial Jobless Claims last week. The Wall Street Journal predicts a reduction of 27,000 (against normal) in the next few NFP prints, and as much as 0.3% off US GDP. We cannot help remembering that it was a the largest storm of the century in Britain that immediately preceded the October 1987 crash. Monday is a solemn day for our finance profession as we remember the thousands who lost their lives in New York 26 years ago. Tuesday is light on reports. Only UK inflation at 0830 is of note. The estimate is 2.8% in line with the Consumer Inflation Expectations print last Friday. As usual we will be monitoring whether GBP is bid or sold into the release. ECB Vice-President Constancio speaks at the workshop at 1345. Wednesday lets us play the UK ONS leak game again with UK Average Earnings and Unemployment figures at the usual 0830, although the main print of the day is the US Producer Price Index. Not normally marked as a high volatility release, this may give an indicator to the all-important inflation print the next day. Thursday is the big day of this quiet week. The Asian session sees the Australian version of NFP. The estimate of 19k translates into the equivalent of 255k in US terms (The US population is 13.5 times larger). This is lower than last month’s 27.5k, but still good growth. The UK rate decision at 1200 is always important. Cable’s recent rise above $1.30 is probably more to do with a depressed dollar than any great confidence in sterling. The hawkish noises we heard in early summer seem to have gone silent. EURGBP tells you a lot about the progress, or lack thereof, being made by UK Brexit Minister Davis. And yet undoubtedly inflation [and its various proxies] are well above the ‘old’ BoE 2% target. However, commentators consensus is for a hold, which could arrest sterling’s recent strong run. The US inflation print is expected at 1.8%, more than last month’s 1.7%, but still below the Fed’s long-standing inflation target. The MoM target at 0.3% is considerably above last month’s 0.1%. With USD at two and half year lows, this release could potentially unleash some volatility. A miss, and worse still a contraction, i.e. below 1.7% YoY could produce a strong downside USD reaction where there is little technical support. Note that this is the first important US release of the week. Friday’s main event is US Retail Sales, followed by the less significant NY Manufacturing Index, and Michigan Sentiment Index. Our comments on Thursday’s inflation apply. Of course each day we move toward the new extended debt ceiling continues to add concern.